I like hummus, it’s good, it’s healthy…..some are better than others (not all are GF). I usually get Sabra – my favorite is the Roasted Pine Nut. But, recently my friend, Alex, shared some hummus that was phenomenal. This is a local company in Asheville, NC called Roots. They make hummus in eight flavors and also offer salsa and dips. I can only speak for the hummus, I tried three of the eight flavors (Roasted Garlic, Thai Coconut Curry and Black Bean) and my friends tried a fourth (Extra Hot Chipotle). I’m not much for hot and spicy, though the Thai Coconut Curry is a tad spicy, it’s so tasty. The bad news is this is a local company and it’s not available all across the country. It is definitely worth a look to see if it’s near you. Even if you’re not a big fan of hummus, this brand could definitely change your mind! It did for my husband who doesn’t usually like hummus. He was a big fan of the Thai coconut curry one. I was so excited when over a year ago I saw an article in Living Without Magazine that Joy Cones were coming out with gluten free sugar and cake cones. Every time I went to the store I would scour the shelves looking for them. I finally just a couple of months ago found them at Publix. 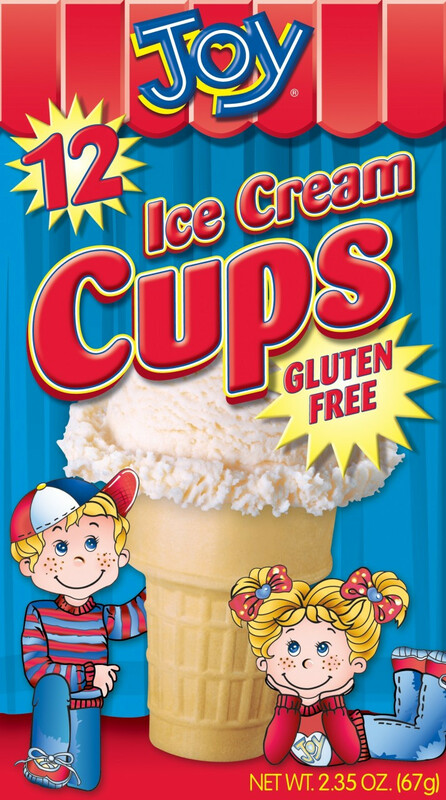 They were only $2.69 for a box of 12, you can imagine my excitement if you’ve ever bought GF cones before, this was roughly half the price I’ve paid before (a rare treat at that price). I just found them at Kroger recently too, for $2.48. I’m sure you will share in my excitement when you find them at your local grocery. Enjoy your ice cream on a cone!! If you need a good recipe for homemade ice cream you should give this Blueberry Cheesecake Ice Cream a try. I have a busy week coming up. One of the things I have to do is have a CT scan on my abdomen. I started wondering if the dye drink was GF. I called and spoke with them, the tech and the pharmacist researched and the one they send home with you to take in preparation for the scan wasn’t GF. She said they had an alternative which the will administer at the hospital. This means 3-4 hours at the hospital instead of 1 but will save me in 6-8 weeks of health issues from gluten. Just wanted to share in case this wasn’t something that you had considered if you ever need to get a CT scan. I will also be out of town for most of the week. I am super excited about this and looking forward to resting and recharging. chocolate chip cookies. All of the were under $5! It was in an odd place though. It was in the bakery, in a freezer that holds the Carvel cakes. Two of the Walmarts near me have a good selection of GF products – one of them has a section on the sugar/flour aisle (ironic, I know) and the other has it on the cereal aisle. I’ll be flying by the seat of my pants for Monday and Tuesday, meal-wise. But, I have planned for while I’m gone. Chick Fil A – the kids all earned free kids meals through the Library’s summer reading program. We were all thrilled that we had earned something that has GF food. Mellow Mushroom – blessed by some dear friends with a gift card, thank you, friends!! I’m always looking for easy to grab and go snacks that are healthy and gluten free. These fit the bill. They’re not super cheap but when you need something that’s easy to take along so you’re sure you have something “safe” to eat, you don’t really care that they are a little costly. I use them for trail mix too and that makes them go further. I found both of these at Walmart. Now turkey meatloaf might not pique your interest, normally, but I hope you’ll give this one a try. It is reminiscent of Thanksgiving. I served it with Apple Cider Glazed Green Beans from my cookbook and baked sweet potatoes (baked at the same time as the meatloaf). It was super moist and delicious. I will definitely make it again. Give it a try and come back and let me know how you liked it. Grease your pan – I used an 10X8 inch glass baking dish. Combine all the ingredients except for the sauce ingredients, in a large bowl and combine well. Don’t over work though, it will make your meat tough. Mix the sauce ingredients and spread over the top of meatloaf. Bake until lightly brown and cooked through (165°) – about 50-60 minutes. Let sit for 10 minutes before cutting. I think the heat has finally set in here in GA. The cool mornings are gone and the humidity is going full force. We got out the pool this week, that will keep the kids from trying to stay in the house all day. We’ll be looking for ways to beat the heat, that’s for sure. We went to the park last week and they have a little water feature there or sprayground as I saw it called once. I also purchased our first watermelon of the season. It was pretty good. The kids loved it. One of the favorite things is to swim in the pool and then eat watermelon on the patio while they dry off. Here’s a cute idea for serving watermelon. Simple pleasures. not the chocolate cups this time, but either the string of balloons or the ceiling deco.